Udupi style Kosambari. 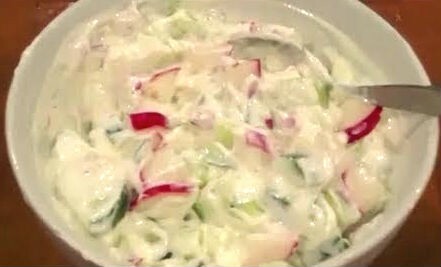 Serve as a salad or as part of a meal. 1. Peel the cucumber if desired and finely chop. 2. Soak the dal for 30 minutes and drain well. 3. Dry roast in a pan for a minute and remove. 4. 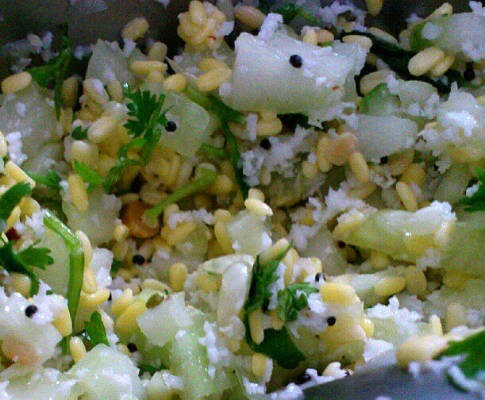 Combine the dal, cucumber, coconut, chillies, salt and oil. 5. Mix well and serve at once. Tip: If you are making this in advance, then add salt just before serving. Otherwise it will become watery. Feel free to comment or share your thoughts on this Udupi Kosambari Recipe from Awesome Cuisine.